Tripp County Emergency Manager, Jon Burdette, is reporting that the National Weather service has issued a Flood Warning for the Keya Paha river, now through Monday. The Hidden Timber Dam in Todd County broke this morning, Saturday, March 23, 2019. Part of the dam has washed away. This dam leads into the Keya Paha river. This will add to the current flooding. Residents along the Keya Paha river are asked to evacuate and get to higher ground. If you have any questions, please contact dispatch in Winner or you may contact Jon Burdette on his cell at 605-840-0342. At 240 PM CDT 3/23/19, county and tribal officials reported minor flooding across the area due to melting snow. Drainage issues are also occurring due to blocked or overwhelmed culverts, causing water to pond or run over roads. 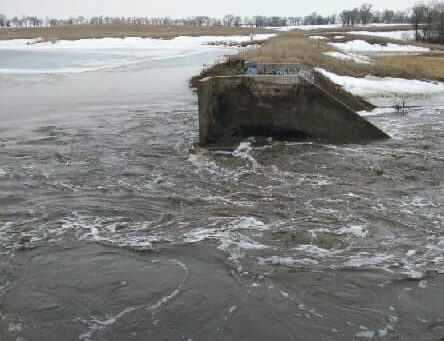 As a result, several roads are closed or washed out, including BIA 7 near Parmelee, 272nd Avenue and 285th Avenue east of Prairie Hills near Mission, and 270th Street in Norris. With warm temperatures continuing through the weekend, flooding issues will persist or worsen.